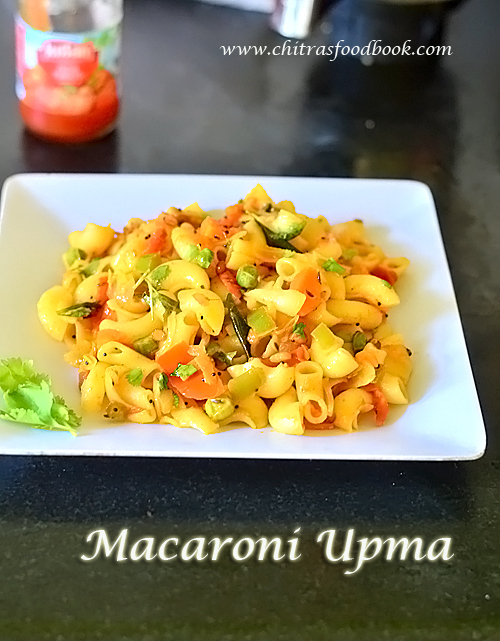 Macaroni upma is an easy, interesting, Indian style macaroni recipe prepared by adding vegetables and garam masala. I never thought it tastes so good. Actually this recipe was suggested by one of my friends. When she told me to make this easy macaroni recipe for Raksha’s lunch box, I was hesitant to try it because Raksha is very fussy when it comes for her lunch box recipes. So I tried it for our Sunday breakfast as the first trial. Raksha loved it very much and told me to pack it for her school this week. Even myself and Sendhil liked it too. So this recipe is a hit in my home✌. No side dish is required for this upma. You can eat it as such. Macaroni tastes so soft, juicy and flavorful. 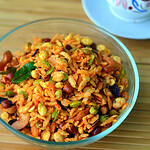 Friends, do try this yummy macroni recipe for your family and share the feedback with me. Lets see how to make Indian style macaroni upma recipe with step by step pictures. Check out my Indian style pasta recipe, creamy white sauce pasta, Garlic spaghetti, Tomato spaghetti, tacos recipe, Indian veg quesedilla recipes ! 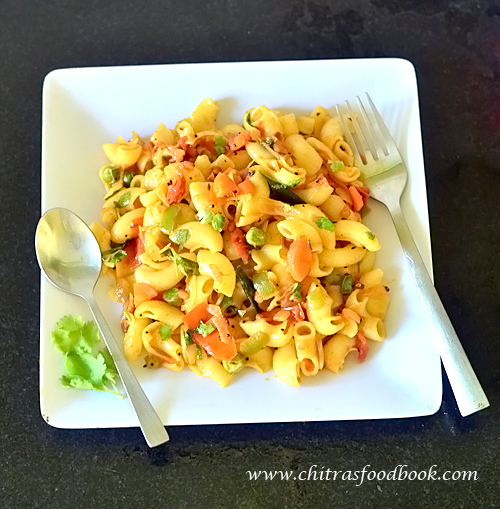 Indian style macaroni upma recipe with onion, tomato, vegetables and garam masala. Boil 3 cups of water in a bowl. Add macaroni. Cook till soft. Drain the excess water and run the macaroni under tap water to retain its shape. Keep aside. Heat oil in a kadai. Splutter cumin seeds. Saute onion, gg paste till raw smell goes off. Add capsicum, carrot and green peas. Add salt and saute till half cooked. Add tomato and cook till mushy. Lastly add turmeric, red chilli powder, garam masala powder. Add some water and cover cook till vegetables are done. Lastly add tomato ketchup. Mix well. Now add cooked macaroni, mix well. Garnish with coriander leaves. Serve hot and enjoy ! In a wide bowl, boil 3 to 4 cups of water. Add a tsp of cooking oil and some salt. After the water comes to roll boil, add macaroni and mix well. Cook in medium flame for 10 to 15 minutes. Stir it every now and then to avoid macaroni sticking to the bottom of bowl. Water spills if you cover cook. So you should cook in an open pan till its 3/4th cooked. Last 5 minutes, you can cover and cook the macaroni in low flame to make it soft. Switch off the flame and drain the macaroni in a sieve. Remove the excess cooked water. Show the macaroni under the tap water to make it retain its shape. Set aside. In a kadai, heat oil. Splutter cumin seeds. Saute onion, curry leaves and ginger garlic paste. Saute till raw smell goes off. Add capsicum, carrot and fresh or frozen green peas. Add salt and saute in medium flame till the vegetables are half cooked. Add chopped tomato and saute till mushy. Lastly add turmeric powder, red chilli powder and garam masala powder. Saute well. Add 1/2 cup of water. Cover the kadai with a lid. Cook till vegetables are soft. After all the water is drained, add tomato ketchup and mix well. Then add cooked macaroni. Mix and coat well in medium flame. Switch off the flame. Garnish with chopped coriander leaves. Enjoy eating hot for best taste ! Adjust the quantity of chilli powder and garam masala powder as per your taste. You can replace macaroni with cooked pasta. Addition of tomato sauce helps to give a creamy base to the paste. So do not skip it. 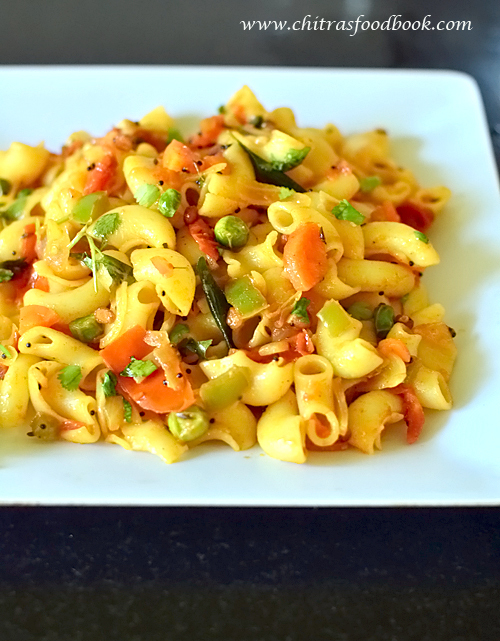 Try this yummy Indian style macaroni upma with vegetables for your breakfast or dinner. Enjoy ! Recently I tasted this Maggi paneer masala noodles in Bannerghatta Meenakshi mall food court. Its a popular street food. In the restaurant menu card, this dish was titled as Paneer noodles delight. I was expecting hakka noodles with paneer masala. But they served Instant Maggi noodles with onion, tomato masala and paneer. Sendhil and Raksha were kidding me that I spent 100rs to eat 10 rs Maggi 😉. Yes, even though it was a bit disappointing I really liked the way they dressed up a simple Maggi to a spicy, tasty paneer masala noodles. I tried to recreate the same at home for our Sunday breakfast. It came out very well and similar to the one I tasted. If you feel, Maggi noodles is unhealthy, you can try the same with any other instant noodles like Top Ramen, Yipee or use plain noodles too. Finally it is your choice. I used Maggi veg atta noodles. So I did not add carrot, green peas or capsicum. I made it in a simple way by adding onion, tomato masala and paneer soaked in water. I did not even roast the paneer pieces in oil as it may make the paneer chewy and hard. 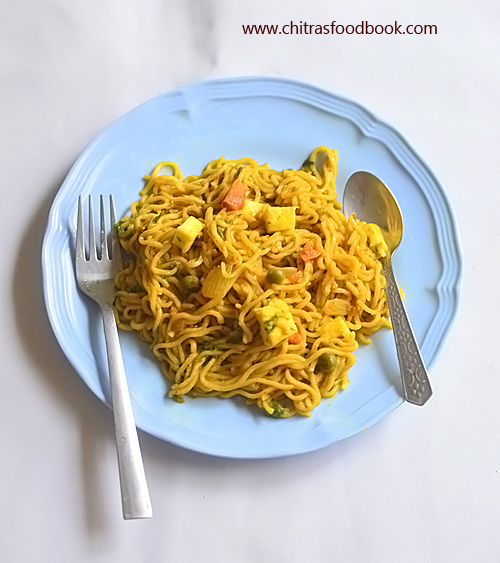 So this version of Maggi paneer masala noodles is very easy and quick to prepare in busy mornings. Bachelors and working women who loves to eat Maggi can try this yummy version. Make your own variations by adding more vegetables or tofu instead of paneer. to make it vegan and healthy. If you don’t want to use tastemaker, you can add garam masala powder and some chat masala powder. 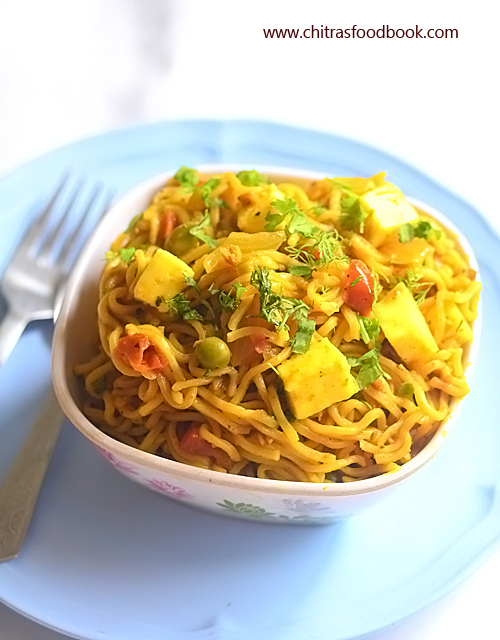 You can pack this masala noodles for lunch box as well. It stays good. Ok Friends, lets see how to make Maggi paneer masala noodles with step by step pictures. 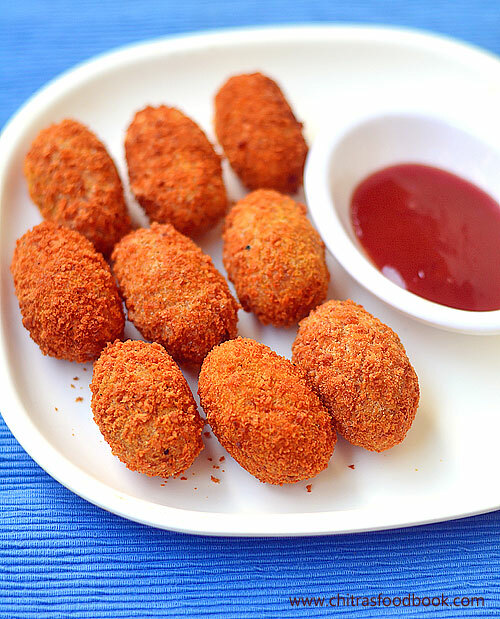 Check out my Maggi Noodles Patties recipe too. Chop paneer into small cubes. Soak in hot water till use. Heat oil and splutter cumin seeds. Add chopped onion, tomato and saute well. Add chilli powder, turmeric powder and little salt, sugar. Add water, noodles tastemaker powder and bring to boil. Break the noodles and to boiling water. Cook till soft. Lastly add paneer cubes and chopped coriander leaves. Mix well and switch off the flame. Remove and serve hot immediately. Boil 2 cups of water. Switch off the flame. 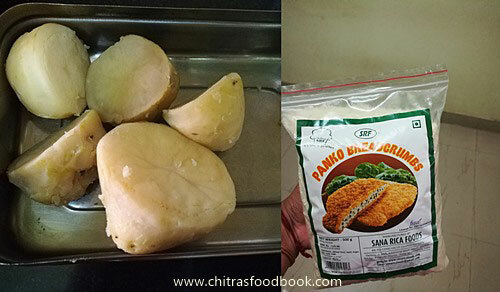 Chop paneer into small cubes as shown in the cover picture. Soak the paneer pieces in hot water till use. It helps to keep the paneer soft. Alternately you can shallow fry paneer cubes in little oil and add to the noodles at the end. Take 3 packets of any instant noodles along with taste maker powder. Finely chop onion, tomato into small pieces. In a wide kadai, heat oil. Splutter cumin seeds. Add finely chopped onion and saute till it becomes transparent. Add tomato pieces, required salt, sugar, turmeric powder, red chilli powder and saute till tomato becomes mushy. Now add water and tastemaker powder. Let it roll boil. Now break the noodles into two parts and add to the boiling water. Keep the flame medium and let the noodles boil in open flame for 5 to 10 minutes till 80% of water is drained off. Toss in whenever needed to avoid burnt bottom. Now cover the noodles with a lid and cook in low flame for 2 minutes to cook till soft. But make sure it doesn’t become mushy. Adjust the quantity of chilli powder as per your taste. You can also add 1/2 tsp garam masala powder for more masala flavor. If you are using plain noodles instead of Maggi, you can replace tastemaker with more red chilli powder, coriander powder, garam masala powder and chat masala powder. 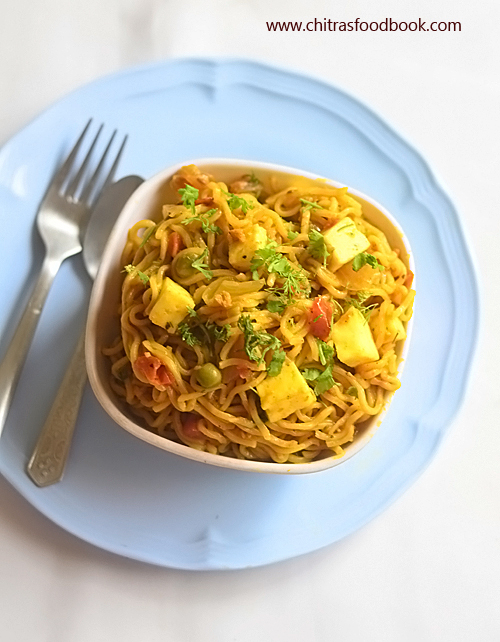 Enjoy Paneer masala Maggi noodles at home. Kids would love it ! Summer vacation is started for Raksha. She requested me to make some yummy milkshakes and ice cream recipes for her. 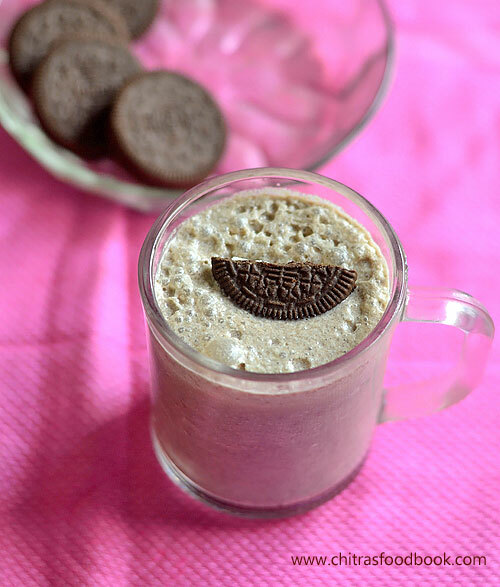 To begin with, I prepared this easy and simple Oreo milkshake recipe without ice cream. As I din’t have ice cream in hand, I added some ice cubes and chilled milk in my blender to thicken the Oreo shake. It came out well with a frothy texture. Raksha liked it very much. The flavor of Oreo cookie and cream along with chocolate syrup, vanilla extract adds a great taste to the milkshake. But to enjoy the best taste of milkshake, you must add ice cream. Soon I will try with ice cream to make it more creamy and rich and make a post here. 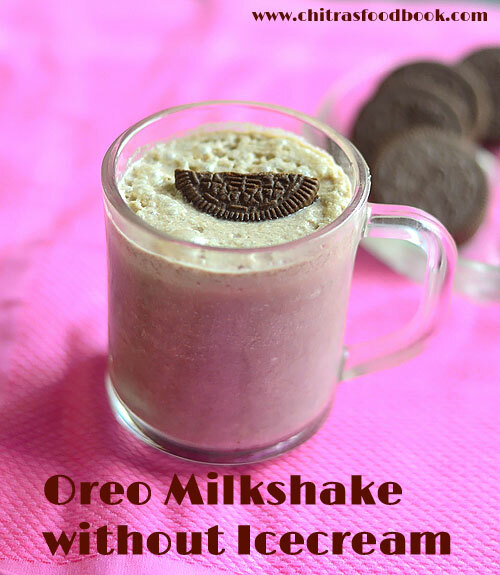 Ok, lets see how to make Oreo milkshake recipe without ice cream. Do check out my Oreo microwave cake and Oreo microwave brownie. Break the Oreo cookies into pieces and take in a blender / mixer jar. Add sugar, milk, vanilla extract, choc syrup (if using) and ice cubes. Run the mixie for a minute. Thick, frothy oreo milkhake is ready. Pour in a glass. Garnish with a piece of Oreo and serve immediately. In a mixie jar/blender, break the Oreo into small pieces. Add boiled , chilled full fat milk, sugar, chocolate syrup, vanilla extract, ice cubes. Grind for a minute till it becomes frothy. Transfer to a serving glass. Garnish with chopped cookies. Serve immediately. For variations, you can add a scoop of vanilla ice cream or chocolate ice cream while blending. Adjust the quantity of sugar as per your taste. 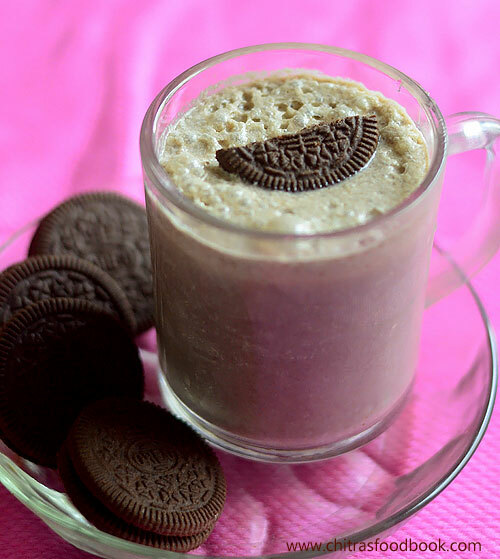 Try this easy, yummy, Kids friendly Oreo milkshake and enjoy ! Cornflakes mixture using Kellogg’s corn flakes. It is made without deep frying in oil. Recently my daughter Raksha tasted this cornflakes chivda in her friend’s house. She told me to try it for Diwali. I asked her friend’s mom for the recipe and tried it today. 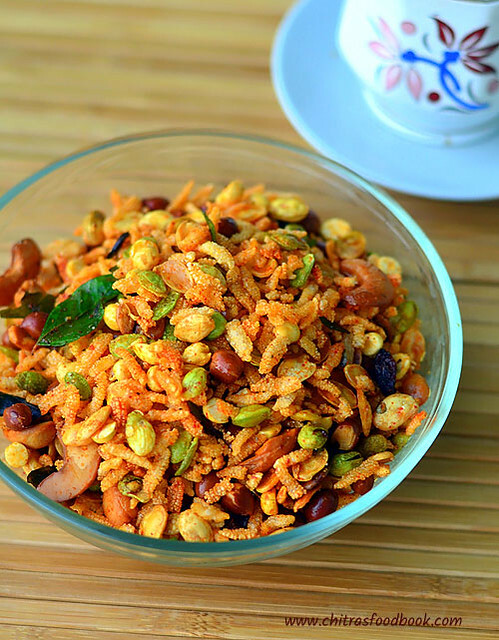 Its a very easy, quick and healthy snack as it has very less oil. Kids & adults would love this for sure.Its quiet additive ! Many of us buy corn flakes cereals (Kelloggs or Kwality brand) for breakfast. 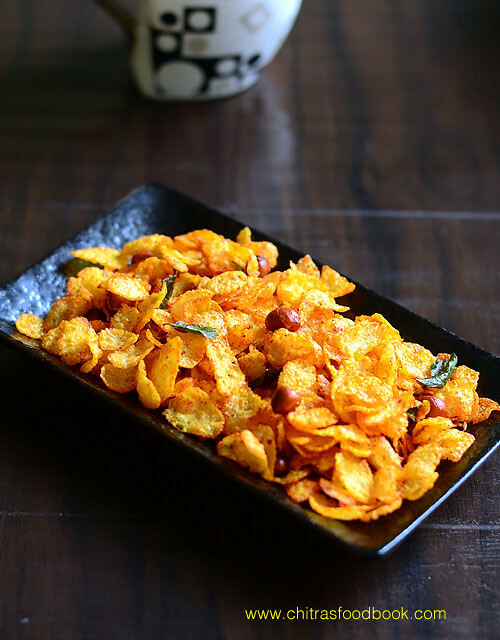 If you have it in hand, you can make this corn flakes mixture in the next 10 minutes. 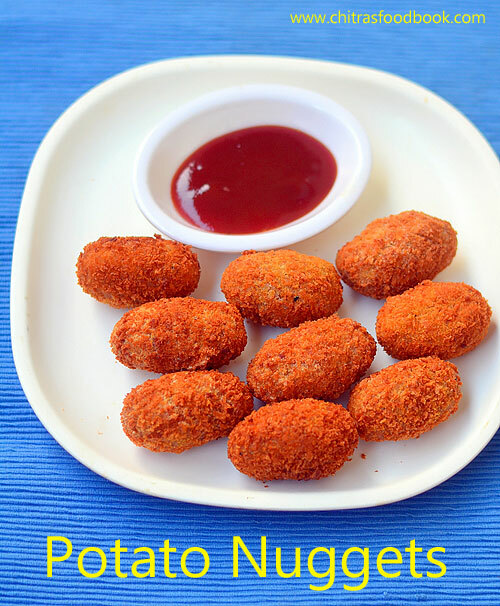 You can pack this for your kids snack box or for their teatime after coming back from school. It can be stored for 2 to 3 days without losing its crispness. 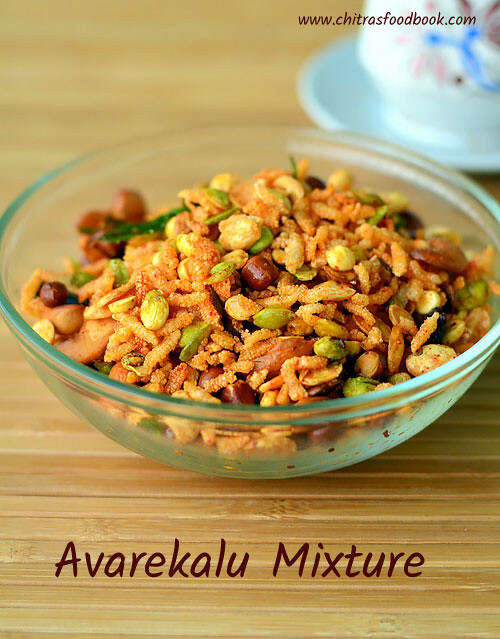 Friends, diwali is incomplete without mixture recipe. If you have not done any mixture recipe, you can try it now. 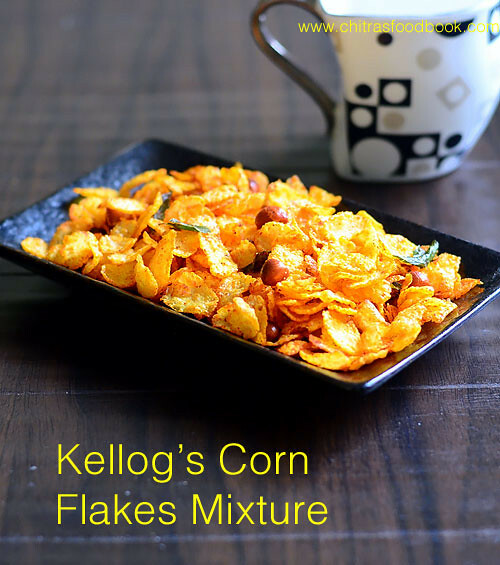 Try this easy, low calorie Kellog’s corn flakes mixture at home and surprise your family.Check out the video recipe below. 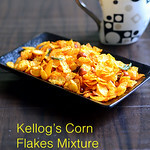 Low calorie cornflakes mixture recipe using Kellogg's Cornflakes with less oil! In a kadai, heat oil and splutter mustard seeds, urad dal and cumin seeds. 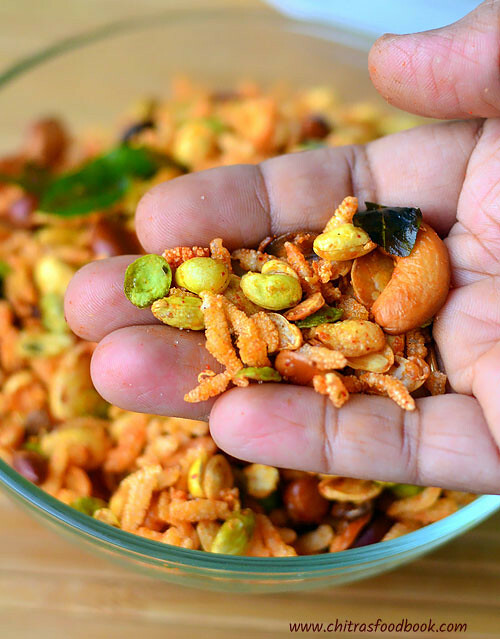 Add roasted peanuts, curry leaves and mix well. Lower the flame completely and add turmeric powder, red chilli powder, salt and sugar. Mix well. Lastly add the cornflakes and mix well in low flame till its coated with chilli ppowder. Check for taste and add 1/2 tsp more chilli powder at this stage, mix well and switch off the flame. Store in a box after the mixture cools down. Stays crispy and good for 2-3 days when stored in an air tight box. Do not use raw corn flakes for this recipe. You should deep fry it or microwave before making mixture. I used Kellogg’s brand corn flakes cereals,original flavor. 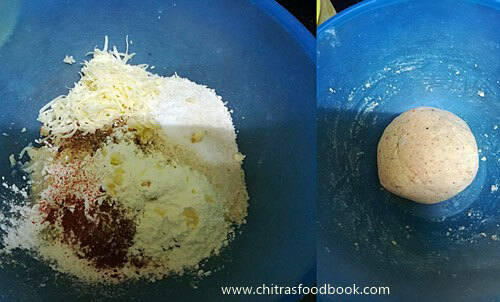 Adjust the quantity of chilli powder as per taste. But keep the flame low while adding chilli powder else it will burn. For variations, you can add raisins and cashews. Saute raisins till it bulges. I din’t use as my daughter doesn’t like it. 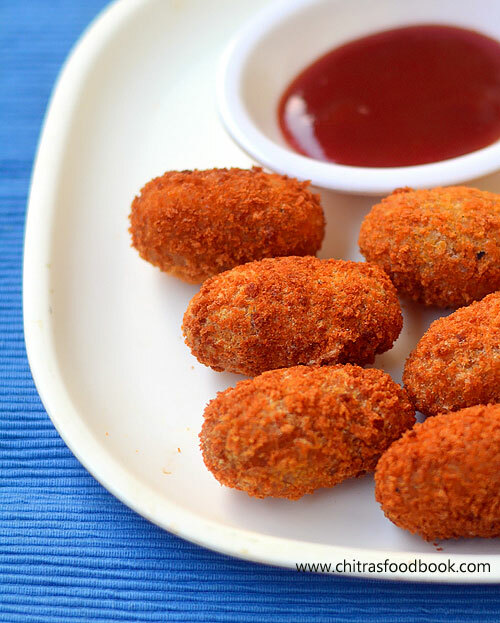 You can also add little chaat masala for more flavor. 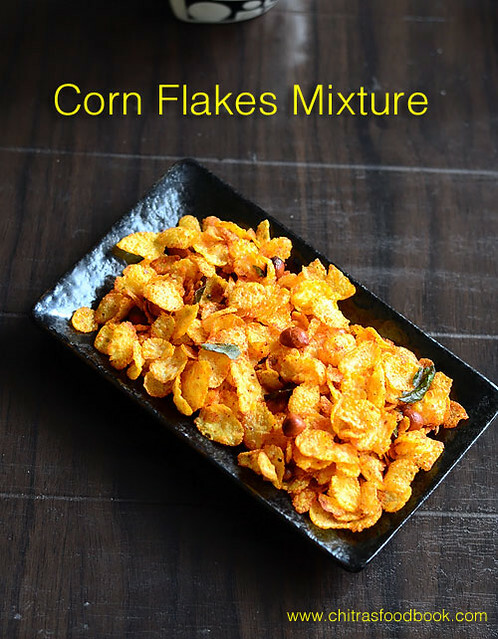 Try this easy, yummy, low calorie corn flakes mixture for this Diwali & kids lunch box. !